Eight months in, nacho reviewing has become too easy. After so many plates of nachos, we could throw out scores and type up reviews under general anesthesia. We need an extra challenge; we need an added dimension of mental exertion. On a recent Wednesday, we also need justification for going to Allston’s White Horse Tavern. Conclusion? We need bar trivia! Yes, going incognito as team Probiotic Blueberry Yoga, the Nacho Patrol multi-tasked through a stellar game of pub trivia and sampled some nachos just for the heck of it. Appearance: (5) Almost as boring as our trivia jockey. Quality of Ingredients: (3) While we aren’t opposed to vegetarian chili, we are opposed to blandness; so far, we have not found a meatless chili that can measure up in flavor to more carnivorous variations. After a few bites, we came to a consensus and liberally salted the entire plate, which helped the overall flavor some. In the beginning, we had trouble finding the cheese on these nachos; but after some digging we unearthed a find– several chips plastered together with a thick coat of melted cheese. Thrilled, we pulled them apart and eagerly ingested. And like a herd of stampeding mustangs, with one taste the memories hit us: the kitchens, back yards, cafeterias and summer camps of our youth, rendered in vivid detail out of semi-congealed grilled cheese sandwiches. Could it be? No, it couldn’t possibly. Or could it?? They couldn’t. They simply wouldn’t! But they did. Yes, ladies and gentlemen, White Horse Tavern committed a sin so vile, so horrific, that it was heretofore unfathomable: AMERICAN CHEESE. Distribution of Toppings: (6) Kraft singles, by their very nature, do not contribute to an even cheese distribution. There were a few 3″x3″ patches of solid cheese coating , but no overall coverage. The chili was moderately well dispersed but there was not enough of it, nor did it provide adequate moisture. Adding insult to injury was our newest pet peeve: wax paper lining the plate. And, for the umpteenth time, the salsa and sour cream on top were a real drag. Price: (7) $9, which would have been $11 if we had wanted guacamole. Overall: 21/40. 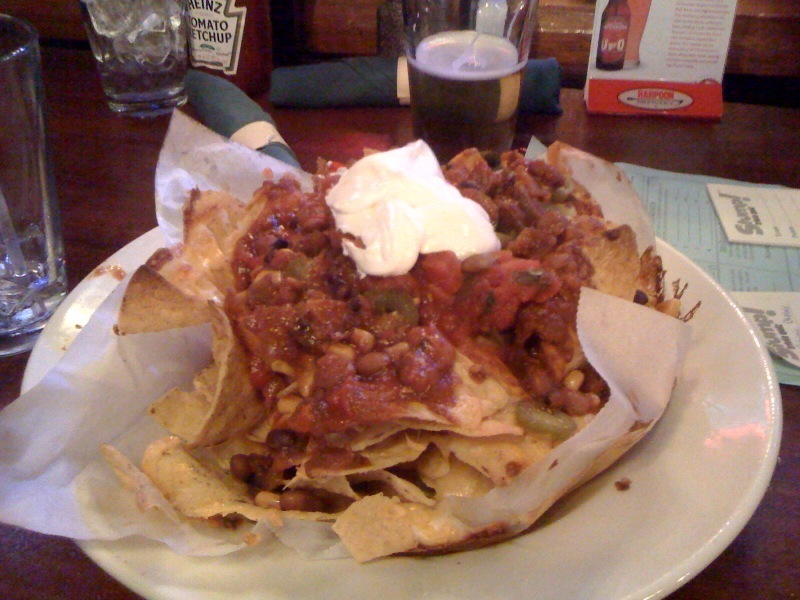 We have to come back (we won $20 of bar credit), but we will NOT be spending it on the nachos! ← Cantina la Mexicana: Mexcellent! I’m boring? Are you frickin’ kidding me?